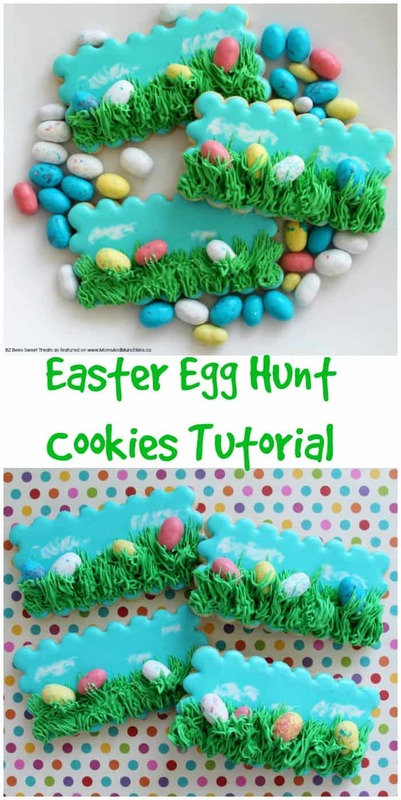 This Easter Egg Hunt Cookies tutorial is courtesy of our contributor Amy of BZ Bees Sweet Treats…Spring is finally here and that means flowers, bunnies, and egg hunts! 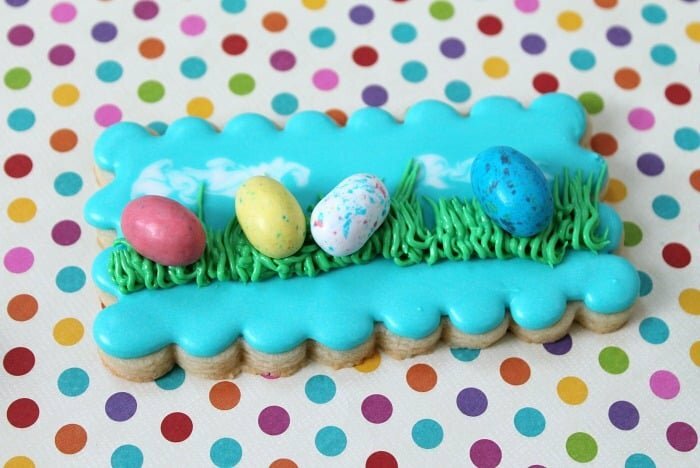 These Easter cookies would be the perfect addition to your holiday dinner. 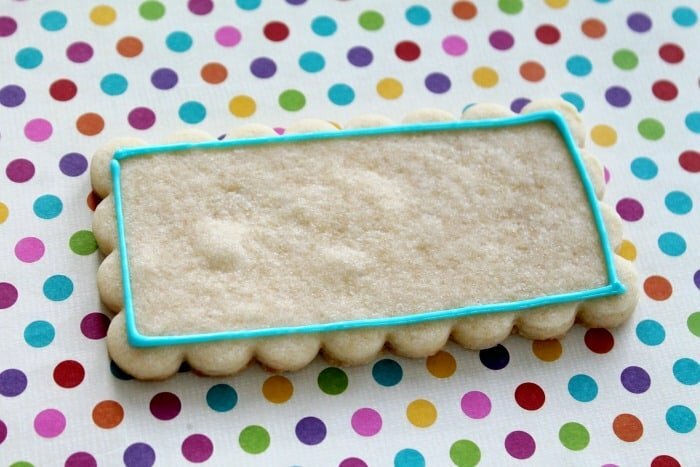 Here’s a delicious rolled dough recipe for the cookies and a recipe for royal icing. 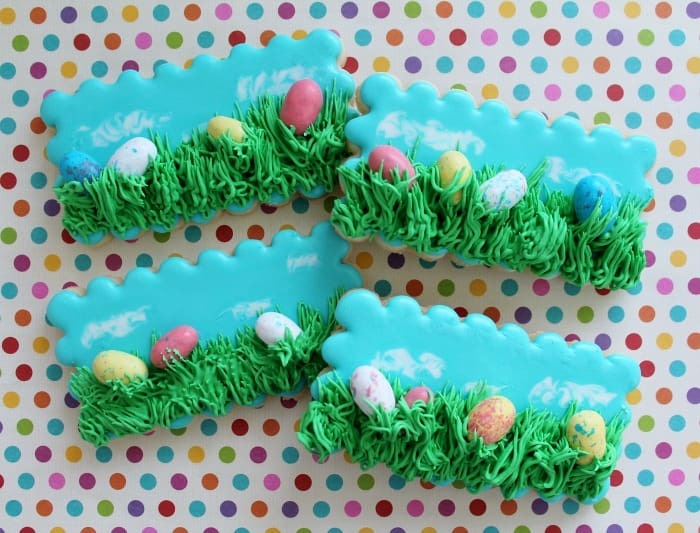 I made my design on a scalloped rectangle, but you can make these on any shape you like – a circle, heart or even an egg shaped cookie would be super cute as well. We’ll start with the blue icing. 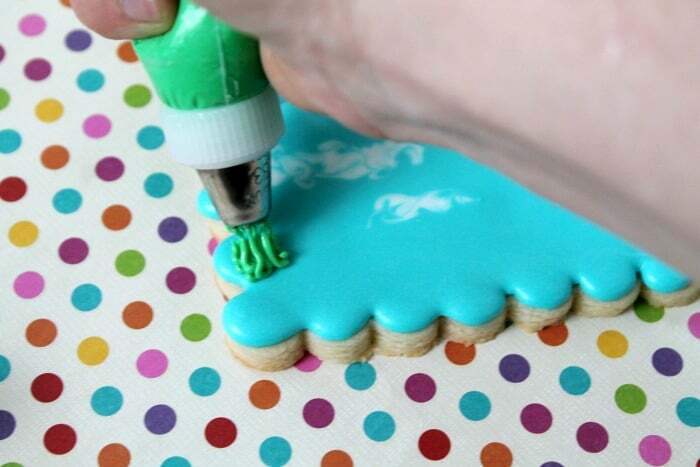 To flood a scalloped edged cookie you’ll start by outlining just below the inner scallop points. Immediately fill in this area, then go back and drop a dot of icing on each scallop. The icing will blend together without running over the sides. 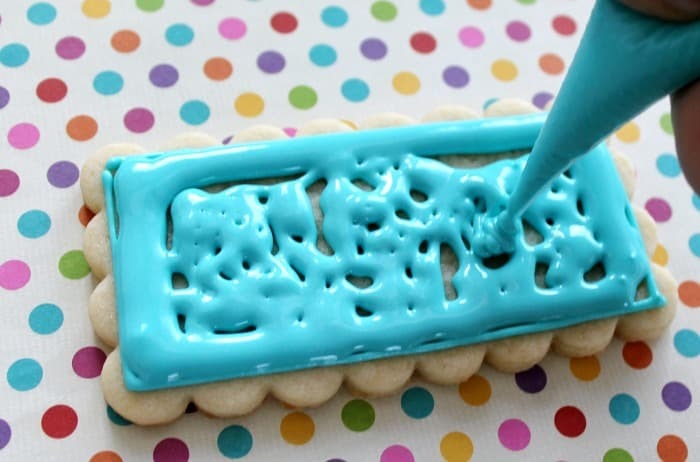 Use a scribe or toothpick to evenly distribute and smooth the icing. Next, we’ll add clouds using the white flood consistency icing. 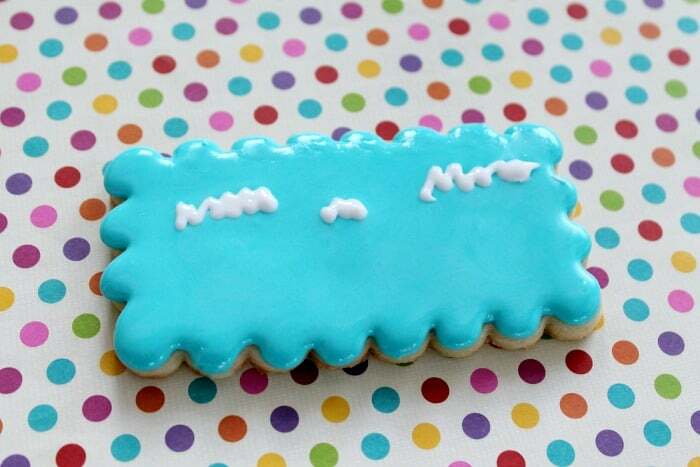 You’ll need to add these while the blue icing is still wet. Draw a few squiggly lines in varying sizes. Use your scribe or toothpick to gently marble and swirl the white and blue together in random patterns. Less is more! You don’t want to totally blend the colors. Allow the cookies to dry a few hours before moving on. 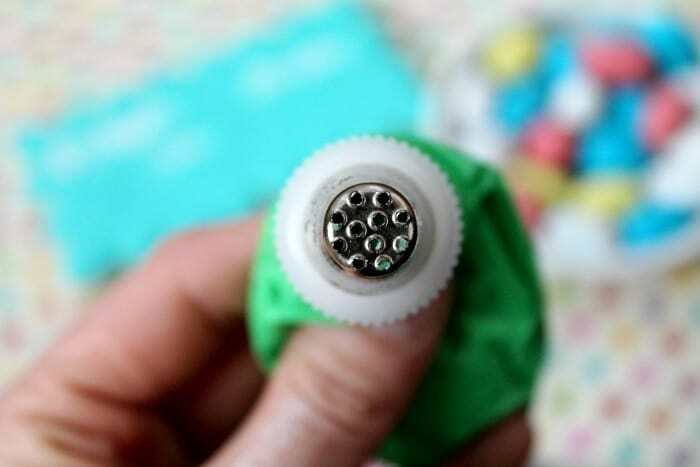 Fill a piping bag with stiff green icing and a Wilton tip #233. This magic tip will give you a grass effect with minimal effort. 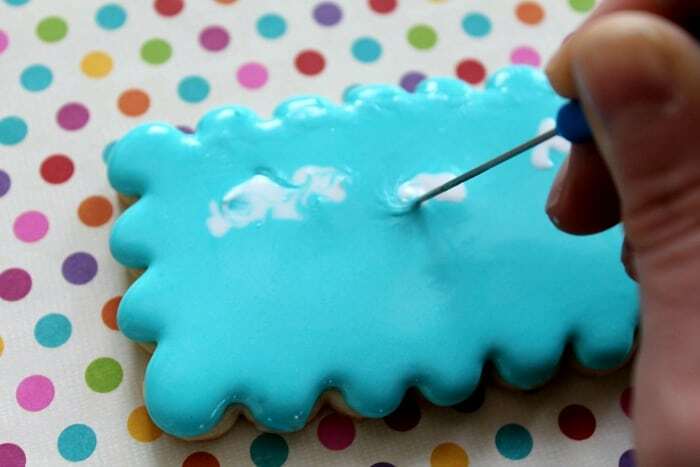 Start on one end of your cookie and apply gentle pressure to your piping bag. 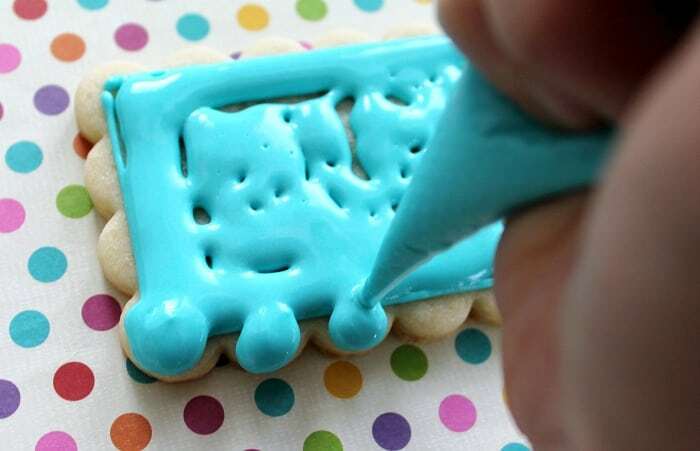 Stop squeezing and pull away so the icing forms little points. You want to pull towards the top of your cookie instead of straight up. Continue this until you have a line across the center of your cookie. 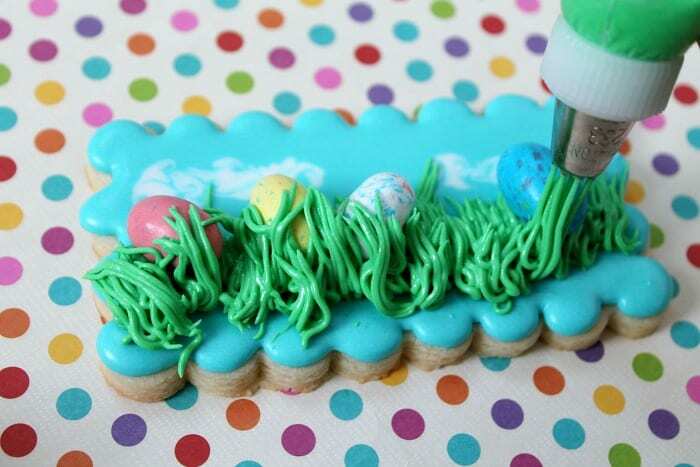 Drop in a few Robin’s Egg candies and then add two more rows of grass, working your way to the bottom of your cookie. 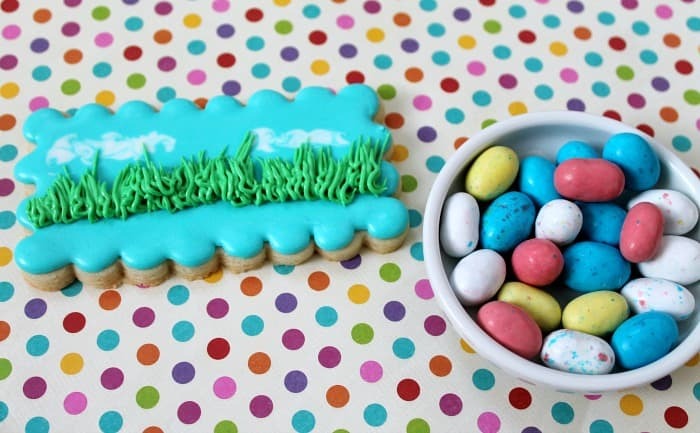 Be sure to overlap your egg candies a bit, so they look like their hiding in the grass. Pretty as a Spring day and the perfect reward after a real Easter egg hunt! Enjoy! 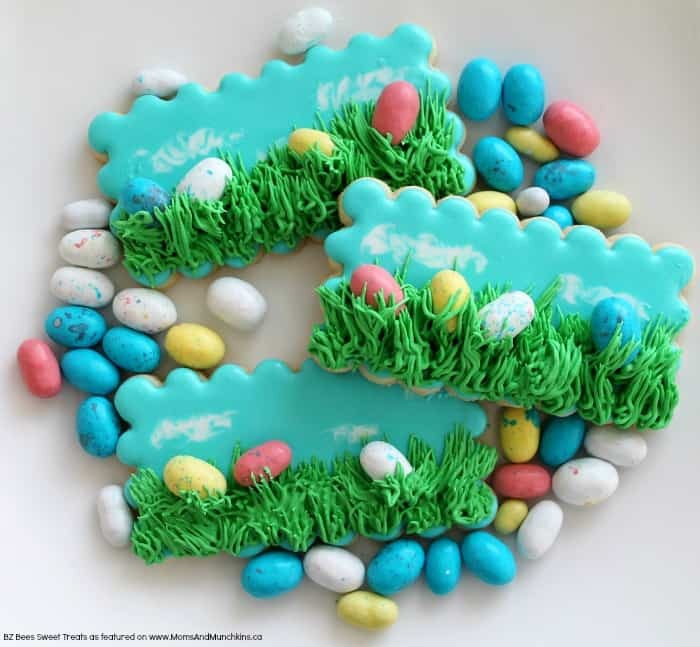 We’d like to send a big THANK YOU to Amy for sharing these adorable Easter cookies with us. Be sure to follow her on Facebook & Instagram for adorable cookie decorating ideas. I first came across her beautiful cookie creations on Instagram and I was immediately a fan of her work! Have a special celebration coming up? You can also order cookies from her! Check out the FAQ section of her website for more information.